When shopping for a camera, reliability should be a key consideration. The last thing you want is to be on a vacation or a wedding and have your camera die on you. But how do you know which cameras are the most reliable? 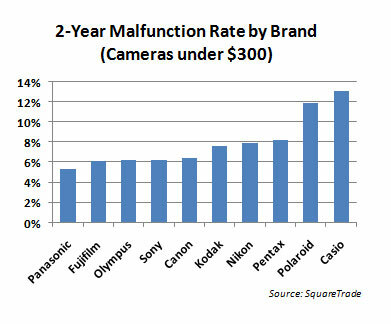 Well, SquareTrade, the largest independent warranty provider, is coming to the rescue with the results of their massive study of digital camera failure rates. The study examined customer reported failure data, from a sample of over 60,000 new digital cameras purchased since 2006 by SquareTrade warranty customers. In its study, SquareTrade found that almost 11% of digital cameras fail over the first 2 years of ownership, with roughly 60% of failures coming from malfunctions and 40% from accidents. 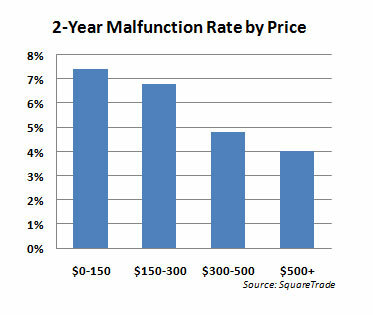 But, there were big differences in reliability between manufacturers and across price points. Not surprisingly, the least expensive point-and-shoot cameras were also the least reliable, while expensive DSLRs tended to be the most reliable. Cameras under $150 had malfunction rates of 7.4% during the first two years, while those from $150-300 were close behind at 6.8%. Above $300, though, camera malfunction rates fell significantly to 4.8%, making them about one-third less likely to fail as cheaper cameras. Cameras over $500, nearly all of which were DSLRs, were the most reliable, with only 4% malfunctioning over two years. Among manufacturers, Panasonic clearly stood out as the most reliable. 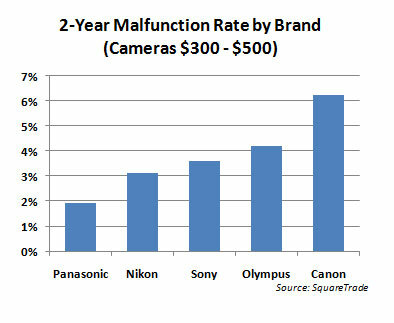 For point-and-shoot cameras under $300, Panasonic cameras had the lowest 2-year malfunction rate (5.3%). The brands with the highest rate of malfunction in the study are Polaroid (nearly 12%) and Casio (13%) – more than double the rate of Panasonic and most of the other top brands. For cameras in the $300 and $500 range, Panasonic was also the most reliable, with less than 2% malfunctioning within two years. Canon’s cameras were the least reliable amongst the five brands with a 6.2% malfunction rate – more than 3x Panasonic’s. For DSLR Cameras, Nikon and Canon were equally reliable with a 4% failure rate. Unfortunately, SquareTrade did not have enough data to analyze other brands. So when you’re shopping for a new camera, keep these stats in mind. 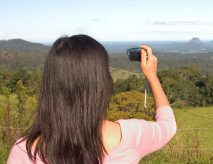 And remember, when it comes to digital camera reliability, you get what you pay for. WOW - I have a 5 year old $99.00 Kodak that has never been a problem. It has traveled around the world, been dropped numerous times and keeps on tickin. I’d never take an expensive camera traveling but when I need to replace it, looks like Panasonic will be the one. Thanks so much for the great info. New Technology or Old Reliability? This is one of the main reasons I’m still clinging to film cameras. A 1 out of 25 chance a relatively expensive camera will fail in two years is now considered good? Many years ago I got a used Pentax K1000. Nothing fancy, nothing automatic except the light meter, just the basics. But I got photo quality as good from that camera as I did from a Nikon that cost three times as much. When I worked for newspapers, that Pentax traveled with me to fires; hung around my neck when I stood on a narrow metal railing in the middle of a freeway photographing an overturned car; and sat on my chest when I shot a train while lying on my back next to the railroad tracks. For several years I shot three or four rolls a week, and the only problem I had was a small repair to one of the lenses after several years of use. I’m still thinking about going digital mostly because film has gotten relatively expensive and I can easily process my own digital shots. But I do miss that old-fashioned reliability. I have 2 Pentax Spotmatic 35mm cameras, one I bought used for $100 in 1982 and it still works great. The other I bought new in 1966 ($120)and it too still works fine. I can easily and quickly make photograph with these fully manual cameras that would take much fiddling with troublesome menus and hard to see buttons on a DSLR camera which costs $700+ and may last only a few years. IMO DSLR’s still have a very long way to evolve to even remotely measure up to film cameras in durability and ease of use. My first digital camera in the 300-500 price range - $240, this was not bad in 2006 - was a Sony. I really liked it, we bought the same even for my fiancée. Not much after two years bout of those have failed. Those could have been serviced on a flat rate price, with postal expenses around 130. Needless to say, I went for a new camera. I needed a better brand, I went for the Canon. Same price range. $350. It worked great but I lost it before anything could have happened to it. So I bought an other one. It stopped working around 3-4 years. Is it good? This are not Chinese socks, I would accept those to last longer. My first cameras were not digital, but still can operate after 20-25 years. I would like digital cameras to know less but to last longer. Now I was thinking to buy a Nikon. Reading the post I think I am gona buy a Panasonic.